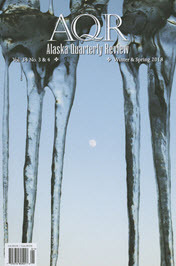 Description: Alaska Quarterly Review is a literary magazine of consequence. The journal celebrated its 35th anniversary with the Summer/Fall 2017 issue. It is published by the University of Alaska Anchorage in partnership with the Center for the Narrative and Lyric Arts. Needs: AQR is seeking submissions of fiction, short plays, poetry, photo essays, and literary nonfiction in traditional and experimental styles. Payment: Payment is not specified on the current writer's guidelines page (as of March 2018). Tips: An interview with AQR founding editor and Editor-in-Chief Ronald Spatz was published in Writers Market and contains advice for submitting writers. How to Submit: AQR is taking hard copy submissions sent via post with SASE or an email address. Online submissions are expected to return in fall 2019.